Autumn 2008 sees me re-visiting Warton Old Rectory, a rare medieval stone house situated in Warton, just off the Yealand Conyers to Carnforth back road. 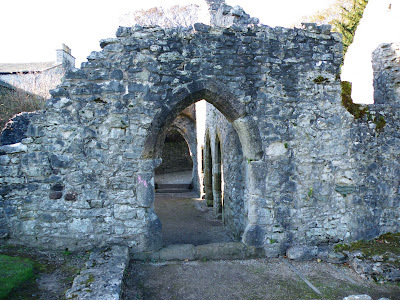 The remains are extensive, with the main body of the late 13th, early 14th century still standing to full height at the gable ends, and most of the windows and doors still in situ. The main reason for the re-visit, was to get some photos of the security of this building, namely, the draw-bar-slot in the main East facing doorway. Apart from the thickness of the walls, the fact that the main doors all exited into a semi-secure courtyard, the draw-bar-slot represents a clear desire for this building to be secured. Against whom...I'm not sure. It's very possible, as with any buildings with this form of security\minor defence, that it was designed purely and simply as security. There's also the possibility that this could be classed as a 'light fortification', but seeing as the building obviously had windows at ground floor level, I'm not sure this is really the case. 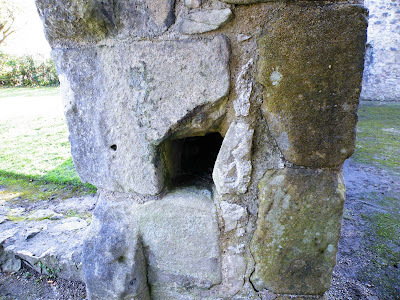 It's possible that any desire for defence or security, was influenced by a Scottish raid in the area dating from 1322. This was a wide ranging period of disturbance, with many villages in the area being raided and damaged. 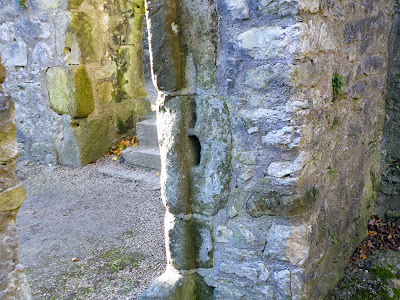 Detail of the draw-bar-slot built into the thickness of the wall. 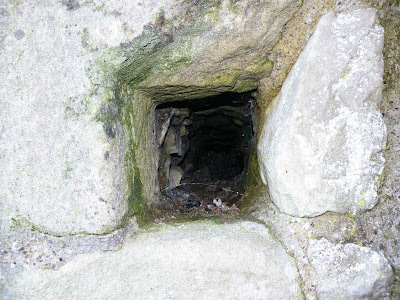 The draw-bar-slot vanishes into the wall to the depth of about three feet, and is about 9 inches square. It was obviously quite a large draw-bar that was used to secure this external door. The above photos shows three smaller draw-bar type slots (one now filled) in one of the central doors. There are three doors of this type, side by side in this wall, and this is the only door with these shallow, oblong slots. This door originally led to a small room that was used either as a pantry or a buttery...so what use security would have been here, is debatable. There's every possibility of course that the use of the room changed at some point.